Available for UK next day delivery. These luxury flowers are inspired by the masterpieces housed at The National Gallery. 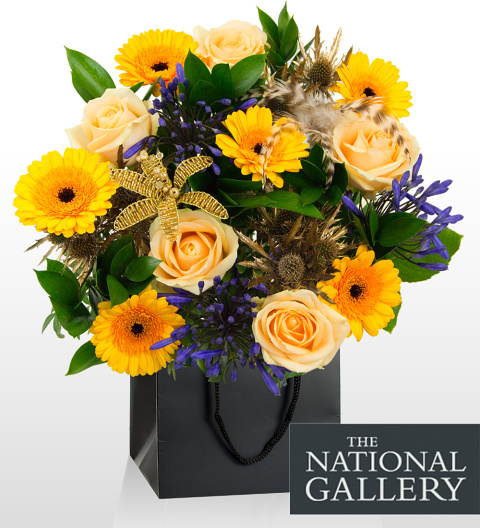 Each fine bouquet is carefully arranged by our floral designers exclusively for The National Gallery. 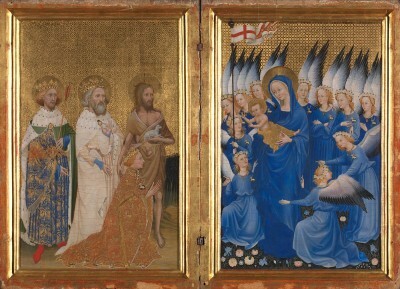 The Wilton Diptych consists of a left and right panel. This bouquet is inspired by the right panel which depicts Virgin and Child surrounded by joyful Angels. This fine work was originally painted for King Richard II of England and it is one of the rarest of all surviving medieval panel paintings. Our professional team of florists have selected the perfect floral combination to represent this memorable work of art. Peach avalanche roses represent the flowers resting on the heads of the angels while the blue agapanthas and germinis represent the blue and yellow aspects of the painting like the blue robes and shimmering hair of the Angels. The flowers around the lower border of the painting are symbolised by the gorgeous gold flower pick that helps bring all of the design aspects together including the blossoming of the flowers at the angels feet. To finish this bouquet off in impeccable style, we also included gold Eryngium for the gold elements of the painting and, of course, the feathers for those glorious angel wings! Perfect for Christmas, send this bouquet to a friend or loved one to celebrate the festive season!